We’d love your help. Let us know what’s wrong with this preview of It's Up to You, Abe Lincoln by Leila Hirschfeld. History gets hilarious in this interactive Abraham Lincoln biography that will have readers laughing while they learn. Perfect for readers of Nathan Hale's Hazardous Tales. Fat History gets hilarious in this interactive Abraham Lincoln biography that will have readers laughing while they learn. Perfect for readers of Nathan Hale's Hazardous Tales. Father-daughter team Tom and Leila Hirschfeld's tongue-in-cheek biography explores ten crucial decisions in one amazing life. With over one hundred pieces of archival and original art, fun facts, sidebars, historical trivia, and more, this book follows Abe's footsteps through the close calls that defined his leadership and shaped America as we know it today. To ask other readers questions about It's Up to You, Abe Lincoln, please sign up. ⭐⭐⭐⭐💫/5 for IT’S UP TO YOU, ABE LINCOLN, the first in a series by the father-daughter pair. This biography examines ten big decisions Abe Lincoln made in his life and argues that his choices are what made him such a fantastic president. Written in 2nd person, giving the reader the chance to be in Lincoln's shoes, each chapter ends with a question and four options for action -- which choice will you make? Then the book goes on to share Lincoln's decision and the aftermath. The book comes ac ⭐️⭐️⭐️⭐️💫/5 for IT’S UP TO YOU, ABE LINCOLN, the first in a series by the father-daughter pair. The book comes across as funny, while still imparting a lot of information in each chapter. "Didya know"s and "Fun fact"s are included throughout the book, as well as images of pertinent people, usually with speech bubbles saying something funny. Readers won't be able to help imagining what could have happened if Lincoln had made different choices and they will come away impressed by his honesty, dedication and practical nature. The end of the book includes a timeline, a who's who, Lincoln's "historic firsts," jokes he played during his life, famous passages from his speeches and an extremely fun section that posits how Lincoln would react to various inventions from the last 150 years (he would love texting and emojis). Overall, this is a highly readable, very funny biography that belongs on all elementary and middle school shelves. Given that there are already lots of Lincoln biographies out there for this age group, that's high praise. I can't wait to see the rest of the books in the series! 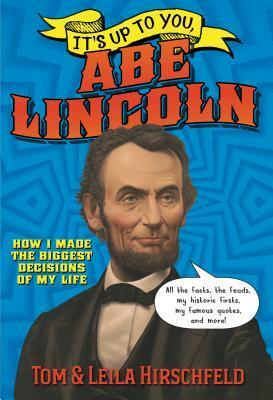 This is a great book for readers who want all the details about Abraham Lincoln presented in a humorous, fast-paced way. There are lots of sidebars and funny captions on pictures, and the facts Lincoln's life are presented and interpreted in a way that they are not in most standard biographies. This was a bit odd to read, though, since it was written in the second person, reflecting the books interest in the decisions Lincoln made. Fantastic interactive format! This biography is engaging, fun and the right amount of information to get an idea on who Abraham Lincoln was, on a personal, professional and political level. Looking forward to reading the rest of the series as it is released. Innovative and interactive! Such a fun and informative read. Learned so many new facts about Abe! The interactive format made the book a fun page-turner.